I love that he's open to letting me help him. I mixed equal parts 3% hydrogen peroxide and water, then had him swish for 30 seconds, spit and rinse several times with water. BF: *shrugs* "What about that tea you made me last time? That helped a lot." Me: "Crap, I can't remember what that was. Let me do some research. By the way, why did your breath smell so fresh first thing in the morning? BF: "I was in pain last night, so I chewed on one of those clove lozenges." Okay! We're onto something. For one, he actually does listen to me (high five!) and thankfully, I had just received my order of Young Living Thieves lozenges. You can find them here, but even singer Kelly Clarkson is a fan! Thieves, of course, contains cloves which have excellent numbing properties. Chewing a whole clove is also an option for toothache relief, however, the lozenges definitely taste better! 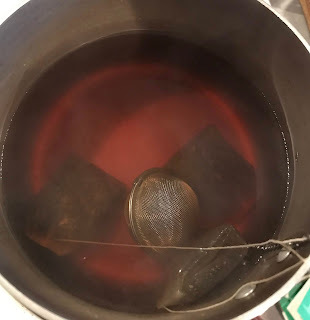 My best guess with all my research was that it was simply peppermint tea. Peppermint also contains numbing properties, so that would make sense. I grabbed my last three bags of Bigelow Mint Medley tea (you can find it on Amazon here) and looked at my poor guy, laying there in pain as he jokingly asked if he was "man fluing." You know, making a bigger deal out of pain or illness than it really is...sorry guys, but it happens. I told him I was pretty sure he was in a tremendous amount of pain and decided to up my game a bit. I put about 6 cups of water in a pot, added the three bags of Mint Medley, then grabbed one of my tea infusers. Since I don't have a spice grinder or mortal and pestle, I did my best to grind 3 tablespoons (1/2 tablespoon per cup for this instance) of whole cloves with my garlic plate. It wasn't pretty, but it worked well enough. Sidenote: I will definitely be adding spice grinder to my Christmas list. Here's a simple and affordable one from Amazon if you're also in the market. I put the ground cloves into the infuser and added one tablespoon of Thyme for its antiseptic properties. I'm impatient and it may not be the best way, but I added the Mint Medley tea bags and the infuser to the pot, brought it to a boil, then reduced to a low simmer for 20 minutes. As you can probably see, I brewed this to be somewhat strong. I wanted the medicinal properties to really present in the tea and knock out the pain as much as possible. I gave him one cup and the rest will go in the fridge so that he can use as needed, including the tea bags. Putting a warm peppermint tea bag on the spot of a toothache for several minutes can also helpful in relieving pain. I'm always open to suggestions in making home remedies even better and more potent! If you have any suggestions, I'd love to see them. Leave a comment or email me right here! PS: After talking about this whole experience with Courtney, she pointed out that you can also add oregano to this recipe to ward off any possible infection, thanks to its antimicrobial properties.